" Their reactions, questions, and even their tears brought hope back into our often tired hearts. Maybe we worried too much and we underestimated ourselves and our music; that we are still needed even if we don’t feel good enough. There was no applause or bravo after we played, because most of them had never been to a concert. They did not know the ‘correct reaction’ after a performance, so all of them said “thank you,” and some visitors even asked to touch our hands out of admiration. Their thanks were simple and their nods of admiration were subtle, but they gave us so much courage—not one of us could have possibly dreamed of this feeling... Everyone had doubts, yet in those glass rooms, out of everyone’s comfort zones, we created so many “one-minutes” that will last for eternity. " "...The exhibition was shorter than a concerto and more impactful than a street tune, the multimedia part of the exhibition had many things to offer for the architecture and visual art admirers. It drew the attention and awareness with stronger appeal to reach a wider audience. Rayna knew the project wouldn’t change societal values over night, but she aimed to create an unforgettable classical music moment in the life of a spectator. 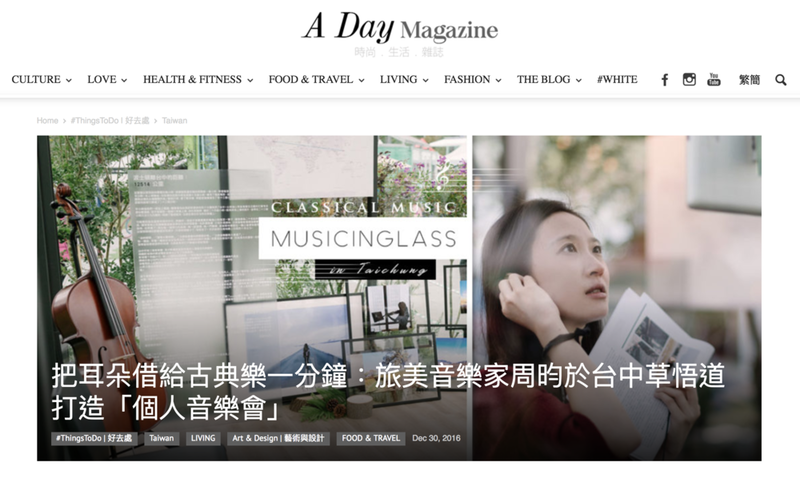 One that facilitated the creation of a conversation which would in turn bring Taiwanese musicians and the public closer. 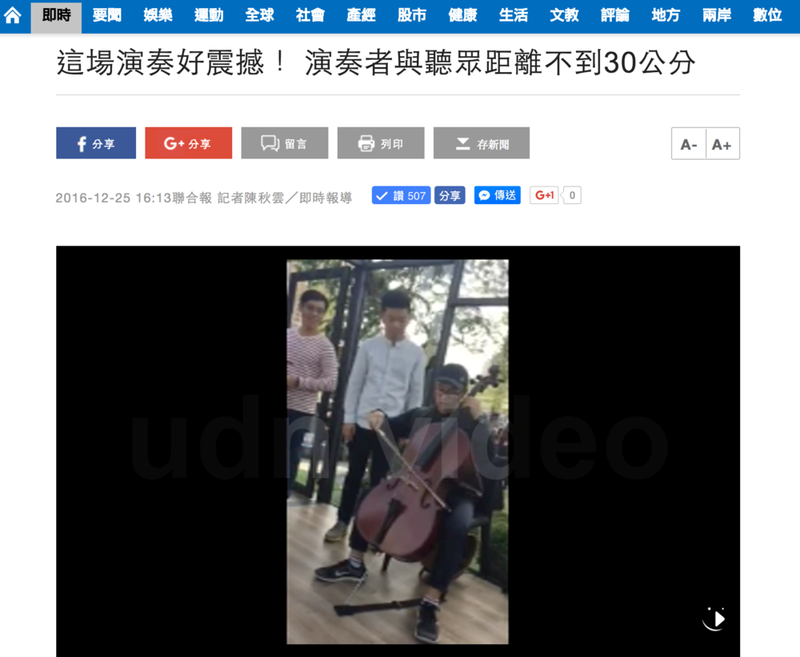 Rayna used photography, writing, film, and cello music to build a very inspirational environment for her viewers in the middle of a busy urban landscape...."
" ... 兩幢引人注目的玻璃屋就佇立在假日市集的中心，在日光的輕吻之下像寶石般閃耀，完美契合周昀渴望將古典樂帶進人群裡的初衷，造訪市集的各路人潮成為絕佳的體驗者。兩幢玻璃屋分別收藏著靜態陳列以及互動式的兩種體驗，用不同的感官刺激訴說著同一件事：古典樂，其實可以離你很近很近 ... 靜態展玻璃屋彷彿一間豢養著靈感的溫室，鋼骨與玻璃構成的建物，讓台中頗負盛名的溫暖冬陽在空間內自由流轉，人們與古典樂交匯時的感動與情緒，更在絕佳的通透性之下向眾人攤開 ... 從玻璃屋中魚貫走出的聽眾們，形容這樣的體驗像是聽了一場「屬於自己的音樂會」，有些人表達十分欣賞與音樂家貼近的距離，感官更因為靠近而變得更加細膩。參與演出的小提琴家劉瀟凡也分享了自己在演出過程中的感覺，他形容在這個小空間當中，演奏曲目時他的專注力從曲目的技巧轉移至與聽眾共同的情緒交流，近距離地觀察到聽眾被音樂感動的神情，也成為他在演奏時前所未有的一種鼓勵... "
"... 這是由新英格蘭音樂院與聖地牙哥樂團2016年合作評選的創業獎得主「Music, distance, and one minute of us」一個結合古典音樂、視覺藝術和建築的展覽 ... 在黑色的玻璃小屋裡，你可以坐在椅子上，享受由素不相識的音樂家，活躍於世界各地之後在你的面前，為你演奏專屬的一分鐘感人震撼的音樂，創造在你生命中特別的一分鐘 ... 另一間透明的玻璃屋裡，則有文字、照片、影片和樂器的各項展示，透過影像和文字探討古典音樂和大眾的距離，同時更提供樂器，開放給來訪的所有受訪者嘗試，讓民眾親自感受拿著樂器的體驗 ... 在各式充滿商業化聖誕氣息、強迫消費的跨年氛圍下，我們終於發現了一個屬於音樂與自己的展覽，提供各位樂友呼吸的地方 ... "
“ ... 音樂會自下午1點起，由擅長鋼琴、小提琴等樂器的音樂家輪番上陣，玻璃屋外排了不少人等著聽1分鐘音樂會，張姓民眾說，很新奇的聽音樂會經驗，雖僅短短1分鐘，卻是令人感覺深刻 ... "
“ ... 安靜地享受古典音樂帶來的永恆與美好，體驗過的民眾直呼太震撼！... 活動由剛獲得美國新英格蘭音樂院創業奬的學生周昀策畫，回饋她成長的家鄉。24、25日連續兩天邀集小提琴、大提琴、鋼琴家與作曲家等10位音樂家於勤美草悟道臨時設置的黑色玻璃屋，每次邀請一位現場民眾入玻璃屋，近距離為其演奏一分鐘的曲目，讓參與者感受到這一分鐘只屬於音樂家和我 ...此外，現場也設置在另一間完全透明的玻璃屋，透過文字、照片、影片和樂器的展示，結合影像搭配三種不同音樂，讓大家體驗古典音樂蘊涵的不同情緒，也提供樂器讓觀眾現場彈奏嘗試，感受拿著樂器的新鮮體驗 ... "
" 一間為全玻璃，作為靜態展覽屋，另一間是烤漆黑玻璃，裡面有音樂家的現場演出，展期只到 2017.1. 3 / 台中草悟道廣場一樓 "